When I studied in HCI, we were taught that the user is very important. When I work with clients I try to solve a problem that will improve their user’s experience. When I design apps, I find that in order to improve the user’s overall experience, both the interface and the interaction flow are essential. For example, when we see a poorly designed app most of us automatically judge it unfavorably before we even start to use. On the other hand, if the graphics of an app are pretty but not functional, people will just say, “cool” but won’t continue to use the app. Coming up with good designs for app is a very involved process. I remembered the first time I designed an app, I absolutely hated the color combination I chose. It just didn’t look right no matter what I did. I decide to get some guidance from my supervisor on how I could become a better designer. She reviewed my work and shared her personal tips with a very important main lesson: “learn and get inspired from everyday things.” She told me whenever she saw good color combination she took a picture and saved it for later use. When she went to conferences and saw appealing slides, she took pictures for later inspiration. She gathered not only graphic design but also interaction design. For example, when she saw a vending machine or elevator buttons that were confusing to users, she would take a picture and spend a little bit time to think and redesigned them. I took her tips and found it is extremely useful. I created an inspiration folder on my phone and take pictures when I see things that inspire me. When I design apps I always turn to my inspiration folder to find ideas that can enlighten me. 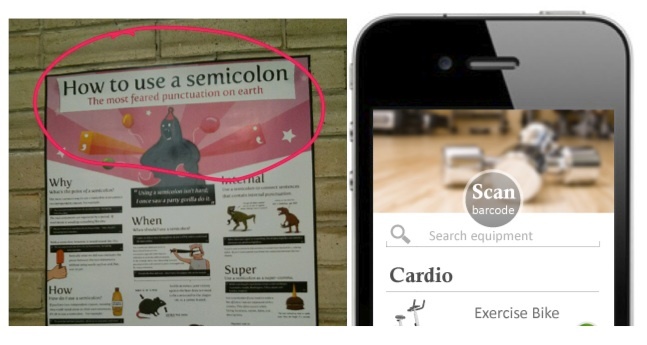 For example, recently, when I designed an app for a local gym, I needed to integrate the words “scan barcode ” on the home screen with a bunch of other information. The first idea that came to my mind was making a rectangle button on the top of the screen, but I thought it might look so dull. When I turned to my inspiration folder and a good idea stood out to me. I found a poster picture that I took from my office and I liked how the title was designed. I followed a similar way to design the “Scan barcode” button. I put the button across the title bar and it ends up not only ended up taking less space (more screen real estate for other additions!) but also add style to the overall design of the app.